Evoked and induced activities are two typical components in the EEG and MEG time series after a stimulation. While evoked activity is phase-locked to the stimulus, induced activity is not. 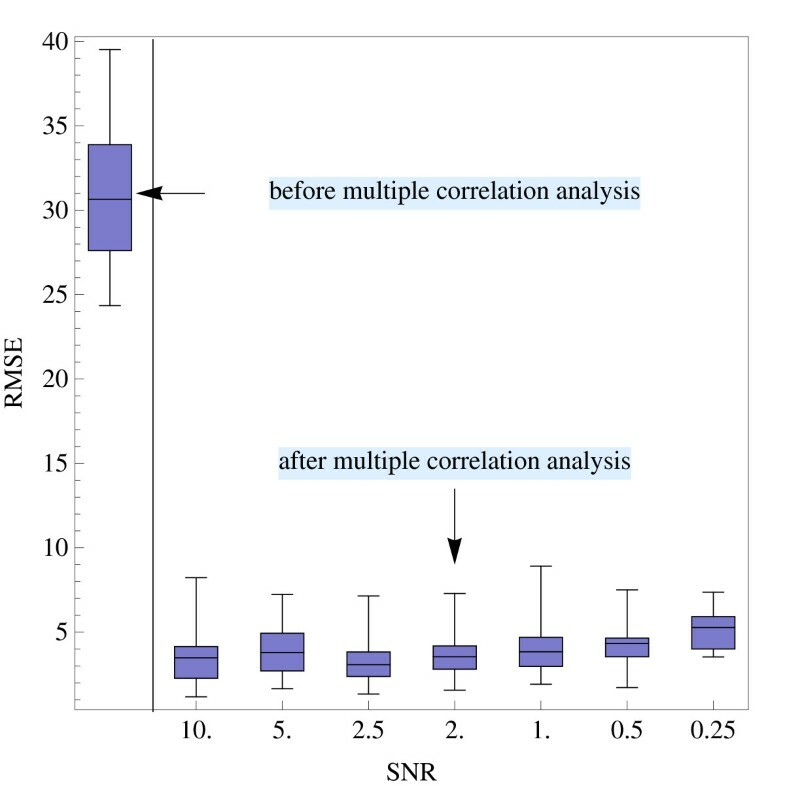 Present analysis methods are able to detect non-phase-locked parts of the signal, however, they do not improve the signal-to-noise ratio (SNR) of these signal components. We present a new method for estimating induced activation in EEG multi-trial data sets. It is based on the multiple correlation of single trials. Our method not only detects induced components within the EEG signal, it also improves their SNR. The method is successfully tested with artificial data sets. Application to real data is exemplified using EEG data recorded in a photic driving experiment. We show that the SNR of the induced activity is enhanced by our method, and the method found longer lasting induced activity after the end of stimulation compared with a conventional method. Time series recorded during neuropsychological experiments by means of electroencephalography (EEG) or magnetoencephalography (MEG) consist of several signal components. Activation, e.g. oscillations observed in different frequency bands, can occur spontaneously or related to a presented stimulus. Stimulus-related oscillations can be classified into evoked and induced activations [1–3]. Evoked components arise in all trials with a fixed temporal delay to the stimulus and are phase-locked. In contrast, induced activations exhibit a variance in the temporal delay with respect to the stimuli and are not phase-locked. However, induced components are often of interest, e. g. for the evaluation of neuropsychological experiments, as they refer to variable cognitive processes in the brain [4–6]. Thus, methods that can separate coexistent evoked and induced activity could enhance the understanding of information processing in the brain. EEG time series are typically very noisy and possess a low signal-to-noise ratio (SNR), rendering the detection of the individual signal components difficult. The most common approach to separating event-related activities is sample-wise averaging of the recorded trials in the time domain. Using this method, the phase-locked evoked components in the time series can be emphasized and their SNR can be improved. However, in this approach, induced components are attenuated by phase cancellation and a valuable source of information about brain activities remains unutilized. In order to investigate induced activities, more advanced signal processing methods are required. The method of event-related synchronization (ERS) and event-related desynchronization (ERD) was introduced by Pfurtscheller et al. [7–9]. Instead of calculating the mean of the amplitude of the time series at each sample point, the instantaneous signal power is averaged to isolate the induced activities. The instantaneous signal power is calculated by squaring the amplitude at every sample point. This method was extended by Kalcher et al. using the inter-trial variance calculated for all sample points. A similar approach to estimate induced activations was used by Tallon-Baudry et al. , Herrmann et al. and Zanto et al. who employed the wavelet power spectrum to calculate the instantaneous signal power. A further approach was proposed by McFarland et al. who utilized a regression based subtraction procedure to estimate induced activities. In this paper we present a new method for detecting induced components in multi-trial EEG time series. The method is based on estimating and equalizing the phase-shifts of the non-phase-locked activations in the single trials. Phase differences are calculated by the simultaneous correlation of the recorded single trials. Most notably, our approach facilitates both the detection of induced components in the signal, and the improvement of their SNR. where m is the number of recorded trials. The latency t is measured with respect to some applied triggers. By computation of the average value of m trials, the SNR of the evoked components can be improved by . However, activities that are not phase-locked to the stimulus are also weakened by this averaging but more slowly than the noise . For a frequency band selective examination of the time series by these two methods, the data has to be bandpass-filtered at the beginning of the analysis. Using the above methods phase-locked and non-phase-locked activations can be separated. However, one common drawback of these methods is that not only the instantaneous power of the induced activities but also the instantaneous power of the noise is averaged. This way, the SNR of the induced components cannot be improved. The time series is used as fixed reference of the correlation. We applied the multiple correlation method to data sets from a previously performed EEG experiment addressing cortical activation related to flicker stimuli . The experiment employed a visual stimulation using repetitive flashes of light with a certain frequency. Such stimulation can lead to an entrainment of the alpha rhythm in the visual cortex which is also called photic driving. During stimulation, the alpha frequency of most subjects is changed towards the stimulation frequency , and it is phase-locked. This effect is preserved shortly after offset of the stimulation . Thereafter the phase-locking to stimulation frequency trails away and the alpha frequency changes back to the individual rhythm. For proof of concept the time series of a single subject (female, age 32, individual alpha rhythm at 10.7 Hz) were analyzed. During the experiment, the subject had her eyes closed and was stimulated with a periodically flickering light. EEG (32 channels, Compumedics Neuroscan) signals were recorded simultaneously. Data were sampled at 1000 Hz and hardware filtered with a pass-band from 0.1 to 300 Hz. The alpha rhythm generally shows a large variability between subjects . Therefore, the individual alpha frequency for the subject was estimated at rest condition. Then, fifteen individual stimulation frequencies were specified with fixed ratios of flicker frequency to individual alpha rhythm ranging from 0.4 to 1.6. Twenty trains of each stimulation frequency were presented to the subject. Every train comprised forty periods of flicker light. Two trains were separated by a rest period of 4 seconds. Artificial time series. The frequency characteristic of the artificial time series used for the validation of the presented method. It consists of three parts. The first part is a harmonic oscillation at 15 Hz. The second part is a linear chirp which starts at a frequency of 15 Hz and ends at a frequency of 10 Hz. The duration of the chirp is uniformly distributed between 50 and 450 ms. The third part is a harmonic oscillation at a frequency of 10 Hz with an uniformly distributed phasing. P S and P N are the power of signal and power of noise respectively, is the variance of noise. t j with j = 1,..., m - 1 are the estimated phase-shifts of the time series and tref is the phase-shift of the reference time series . For every SNR twenty runs were performed and the mean μRMSE and the standard deviation σRMSE of RMSE1,..., RMSE20 of the single runs were calculated and compared with the uncorrected data, see Table 1 and Figure 2. As can be seen, by applying multiple correlation analysis to the artificial time series, the phase-shift of the non-phase-locked signal components could be considerably reduced, even for data sets with a low SNR. Results of validation using artificial time series. Mean μ and standard deviation σ of the RMSE of the known phase-shift parameters before correction and the remaining phase-shift after multiple correlation analysis. For the analysis of the time series, phase-locked activities were first estimated and removed from every single train, resulting in see equations (2) and (3). The main focus of our analysis of the non-phase-locked activities was on the alpha rhythm in the time segment from 0 to 512 ms after stimulus. Therefore, before employing the correlation method, the single time series were bandpass-filtered from 2 to 20 Hz, comprising all possible stimulation frequencies. The time segment from 0 to 512 ms after stimulus offset was masked using a rectangular window. For determining the shift parameters, the search space for (τ1,..., τ m ) was restricted to ± 50 ms. The estimated mean of the shift parameters (τ1,..., τ m ) was = -2.7 ms with a standard deviation σ τ = 35.4 ms, the minimum and the maximum were -50 ms and 50 ms, respectively, which was the border of the search space. Afterwards, the trains were corrected by the estimated shift parameters (τ1,..., τ m ). The resulting time series sc j (t) were averaged, see equation (14), and time frequency representations were calculated. 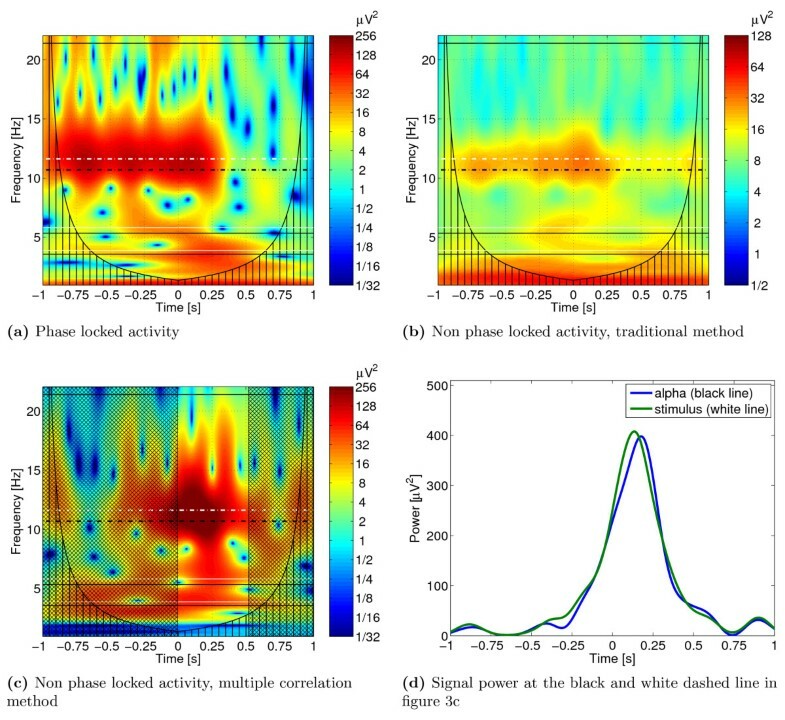 The adaption of the alpha rhythm to the stimulation frequency can be analyzed by estimating the phase-locked activity. Results of this part of our analysis are presented in Figure 3a. In this example, the subject was stimulated at a frequency corresponding to 1.1 times the individual alpha rhythm previously determined at rest. The adaption of the alpha rhythm to the stimulation frequency (white dashed line) can be well observed. The individual alpha rhythm estimated for the subject is marked by the black dashed line. Application to EEG data. Time-frequency representation of the phase-locked and non-phase-locked activities in the EEG channel O1. The black dashed line marks the alpha rhythm estimated for the subject (10.7 Hz), the white dashed line the stimulation frequency (11.63 Hz). The black and white solid lines are the harmonics and sub-harmonics. The offset of the stimulation happens at t = 0. Figure 3a shows the phase-locked activity. Figure 3b shows the non-phase-locked activity calculated using equation (6). In Figure 3c the non-phase-locked activity estimated using the multiple correlation method is presented. The non hatched time segment is used for the correlation analysis. In Figure 3d the signal power of the oscillatory activities around the stimulation offset at the individual alpha rhythm of 10.7 Hz and at the stimulation frequency of 11.63 Hz is shown. Note the different color maps in the figures. The synchronization of stimulation frequency and alpha rhythm continues to t = 200 ms after stimulation offset, and afterwards ends gradually. This behavior can be investigated by estimating the non-phase-locked activity after offset of the stimulation. The divergence of the synchronization of the alpha rhythm starts at t = 100 ms after stimulation offset. 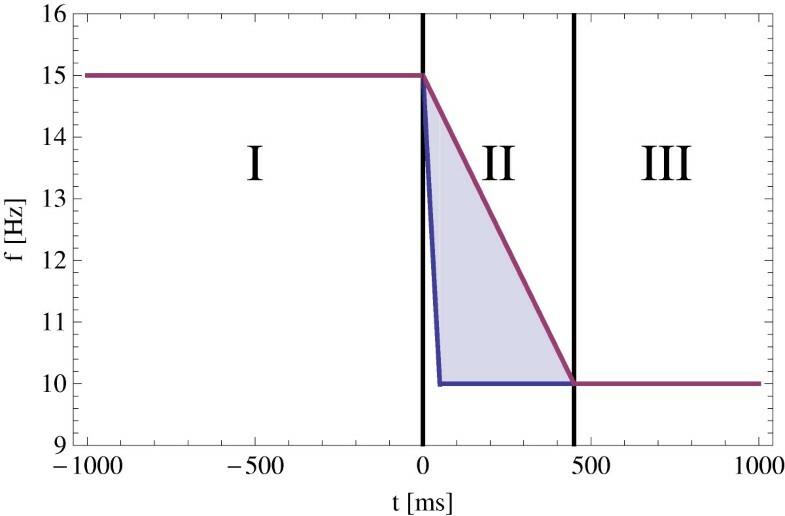 It is reflected in the increasing non-phase-locked activity in the time segment from 100 ms to 250 ms after stimulus offset, which slowly decreases to 350 ms. As can be seen in Figures 3b and 3c, due to the improvement of the SNR, this phenomenon can be much better recognized by our correlation procedure (Figure 3c) in comparison to the conventional procedure (Figure 3b) for the determination of induced activation. The signal power of the oscillatory activities around the stimulation offset at the individual alpha rhythm of 10.7 Hz and at the stimulation frequency of 11.63 Hz is presented in Figure 3d. The maximum activity at the stimulation frequency appears at 134 ms after stimulation offset. In contrast, the highest activation at the individual alpha rhythm occurs 33 ms later at 177 ms after stimulation offset. We have presented a new method for the detection of non-phase-locked components in EEG time series. In contrast to traditional procedures, our novel method estimates and compensates for the phase-shift of the induced components in the investigated single trials. This way, it is possible to isolate induced components in EEG time series and, moreover, to simultaneously improve their SNR. Latency adjustment averaging techniques related to the introduced multiple correlation method were already used to estimate evoked potentials . In this method a template of the expected evoked potential is fitted to the single time trials. A traditional stimulus-locked evoked potential is used as template and cross-correlation is applied as similarity measure. Single trials which do not pass a criterion level are excluded from further analysis. In the next step the single trials are realigned at the latency point which correlates best to the template, and the evoked potentials are estimated by these latency adjusted trials. This method can not be applied to detect induced activity, however. After removing the phase-locked components from the single trials they have zero mean. A template can thus not be determined. In our multiple correlation method a criterion similar to the criterion level in the latency adjustment averaging technique  could be established. Trials with an estimated shift parameter on the border of the search space could be treated as noise and excluded from the averaging. The application of the multiple correlation method requires a priori information about the frequency band and about the time segment where non-phase-locked activity is expected in the investigated time series. Both parameters, the chosen frequency band and the time segment, also influence the optimization step which is employed to estimate the phase-shifts of the trials. The search space for the optimization can be constrained depending on the chosen frequency band. If a certain frequency is investigated, the search should be restricted to ± half of its wavelength. For investigating a frequency band, ± half the wavelength of the lower cutoff frequency should be used. The length of the analyzed time segment should be greater than or equal to the wavelength of the observed frequency. On the other hand, it should be short enough to keep the phase constant in the time segment of each trial. Most notably, the SNR of the estimated non-phase-locked signal components can be improved simultaneously by similar to the estimation of evoked activities. This could not be achieved by traditional methods so far. For a comprehensive analysis of the common EEG frequency bands, the time series can be bandpass-filtered. Afterwards, the multiple correlation method can be applied to the separated frequency bands. Note that the computational costs of the procedure increase exponentially with the number of examined trials. Therefore, the procedure is suitable only for the evaluation of experiments with few time series. The optimization step of the method is particularly time-consuming. Endeavors to reduce the computing time should thus focus on this part of the procedure. One approach could be the use of evolution strategies . At present the multiple correlation method is programed in a sequential manner. Some steps, e. g. the calculation of the correlation matrix and the optimization step, offer the potential for parallelization which again could decrease computation time. This work was supported by the Deutsche Forschungsgemeinschaft (Ha 2899/8-1, Ha 2899/5-1 and Wi 1166/9-1) and the Bundesministerium für Bildung und Forschung (03IP605). A preliminary version was presented at the BMT 2006 Zurich. HW and JH supervised the project, analyzed the final results, and helped drafting and revising the manuscript. UG developed the presented method, validated and applied it, analyzed the results and drafted the manuscript.